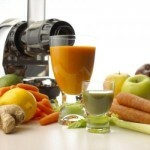 Want a Great Family Friendly Juicer? 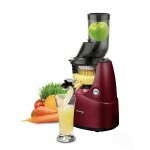 A budget friendly juicer, you get what you pay for with the Breville BJS600XL Fountain Crush Masticating Slow Juicer. 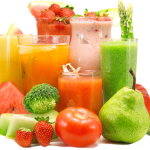 If you’ve had any experience with a centrifugal type juicer, you’ll remember that the juice it produces is a little frothy and there is very little pulp. With the Fountain Crush Masticating Slow Juicer, there isn’t a significant change in the amount of froth produced, but it allows more pulp to come through. 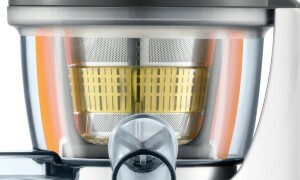 This is because the mesh screen inside of the appliance has larger holes than traditional centrifugal juicers. While this can be a cause for celebration for some, it can be a deal breaker for others; it just depends on whether or not you like your juice to have a little body in it. You’ll need to chop your ingredients into pieces before placing them through the chute, to get the best juice, especially if you are using large vegetables and fruit. Admittedly, there are a lot of juicers on the market that require you to chop up your ingredients before feeding them through. Those that can drag your vegetables and fruits down themselves tend to be on the pricier range of appliances, and not everyone can afford those. The noise level is extremely satisfying. As opposed to a loud centrifugal juicer, this masticating juicer is pleasantly quiet and doesn’t sound like a rocket taking off, regardless of the time of morning or night you’re making your juice. The masticating juicer essentially “chews”your ingredients to extract the most amount of juice from them, instead of spinning them at high speeds. 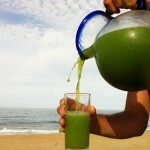 This leaves you with a rich nutrient-filled glass of juice and a much drier pulp. Since this juicer doesn’t spin your ingredients at high speed – and therefore doesn’t create any heat – you can keep a glass in the fridge for later and don’t need to worry about the oxidation process happening too rapidly. All parts of the juicer must be perfectly in place before starting, so there isn’t any risk of you accidentally getting a finger caught in the appliance while it’s in use. It also offers a handy reverse button, which can help dislodge some stuck pieces of fruit or veggies. 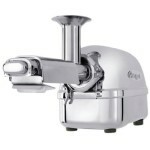 Is it worth saving a bit of money with the Breville BJS600XL Fountain Crush Masticating Slow Juicer ? 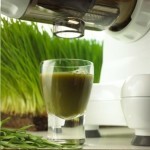 Though this juicer is on the cheaper side of things, it’s not a cheap nasty juicing machine. No, it doesn’t have any fancy buttons or extras, but it most certainly does the job. 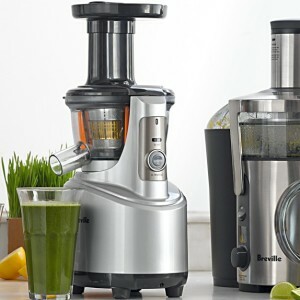 If you’re looking for a juicer that is mid priced, reliable, and will create healthy, delicious juice day after day, the Breville BJS600XL Fountain Crush Masticating Slow Juicer does the job very reliably and well . Just keep in mind that you may have to take a little extra time out of your day to prep your ingredients and clean up after you juice.